There are reasons why campaigns are undertaken by organizations, both large and small. After all, it is these campaigns that help propel their sales, create new chances for add-on sales, and improve the image of products and services. 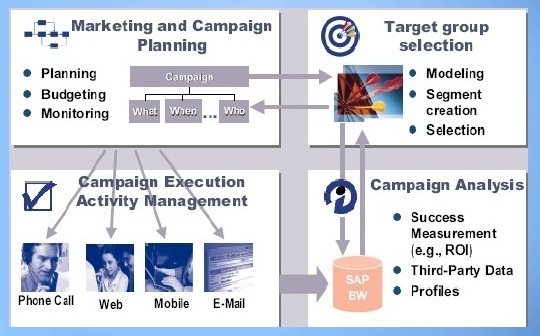 Campaign management in SAP CRM gives a new dimension to this effort of yours. In fact, in using this tool, you can use different channels for implementing various outbound and inbound campaigns. Furthermore, they all can be combined by using different optimization techniques to define and implement marketing strategies for determining a suitable marketing mix. Here is an introduction tutorial about SAP CRM Campaign management and a pdf guide about Campaign automation. What is really good about campaign management in SAP CRM is that it is flexible. With it, you can do permission checks and then go about setting up campaigns automatically. Your campaign can be set such that it can facilitate inbound customer interaction. It is only when the customer contacts the company that these campaigns are considered complete. The Interaction Center is a good example of this kind of campaign. The thing with inbound campaigns is that there are no executions via outbound channels. In this case, the campaigns are set up for outbound customer communication, for example, a vendor communicating with a potential customer. How are these campaigns executed? These campaigns are usually facilitated through any of the supported channels, like e-mail or the Interaction Center. Making use of campaign wizard – Here a single group can be targeted for creating simple campaigns, wherein the group doesn’t feel the need to have all the functionality of the campaign management. In order to use this function, you need to activate the business function Campaign Wizard. What’s more, the configuration of communication media can be undertaken based on your specific needs. However, for this, a business function called Marketing Permission needs to be activated. You can also choose to have campaign automation processes using multi-channel and multi-wave features, besides the periodic campaign processes. These processes are directed towards gaining direct reactions to responses from customers. Enabling campaign automation can benefit employees directly. For example, they can access automation tools by themselves automatically using the campaign screen, get the plans improved, and ensure transparency. You model can be successfully modeled using campaign automation. Once there is a trigger of the process model, manual intervention will no longer be required. What’s more, there can be an immediate response to a particular step. Else, you can set up the model for a batch response. For example, the response can be generated once a particular number of responses have been collected or at periodic intervals. Remember, you can employ campaign automation for planning and executing those campaigns that start off with low volumes and eventually ends with high volumes. However, it is not possible to start the campaigns with low volume executions and progress to high volumes.